I read this article and found it very interesting, thought it might be something for you. The article is called Restaurant Review: Passion 4 Food and is located at https://www.totallydublin.ie/food-drink/restaurants/restaurant-review-passion-4-food/. A good rule of thumb for food enthusiasts is that it’s wise to be wary of food establishments that replace letters with numerals in their name. Passion 4 Food on Clanbrassil Street, however, is the exception that proves the rule. This humble kebab shop has been buoyed by word of mouth since opening in 2009. There is something different about this place, something that is a cut above the rest. Even the Dublin Kebab Club has voted them the best kebab in Dublin for two years running. What might catch your eye when you place your order to eat-in or takeaway for a chicken or lamb doner at Passion 4 Food is the tandoori oven, also known as a taftoon. “Your bread is dough until you order it,” says Ibrahim. “We don’t pre-make the bread.” Instead, a pan of dough balls sit covered behind the counter. When an order comes in, they’re shaped by hand, rolled with a baking pin and thrown against the clay interior wall of the taftoon oven. It’s ready in a few minutes and served still warm from the oven. This ethos runs through the kebabs. Where other shops might order in pre-made meat stacks, often with processed meat or even mince (Ibrahim shudders at the thought of that), the kebab stacks are built in Passion 4 Food’s kitchen using 100% Irish and halal meat, though not free-range. In the kitchen, we’re proudly shown a pile of chicken which is deboned, butterflied and marinated in a dose of paprika and Ibrahim’s secret spice mix. It’s more expensive to do it this way, of course, but Ibrahim wants to know exactly what is in his kebabs. One of his team is assembling the kebab by carefully layering the chicken on the spike that holds the chicken doner (€8.30) together. The lamb doner (€8.30), one of their specialities, is made with lamb steaks and lamb shoulder marinated with a closely guarded secret mix. Both the chicken and lamb kebabs are slow-cooked for a few hours on the rotating doner kebab grills, and given an occasional blast of heat to get a crispy crust. The team here don’t pre-cut their kebab meat, leaving it to keep warm (and dry out) in a bain-marie. When an order comes in, the bread gets rolled and the meat gets cut. This is fast food with a lot of self-respect. Just because it’s speedy shouldn’t give cooks license to cut corners. 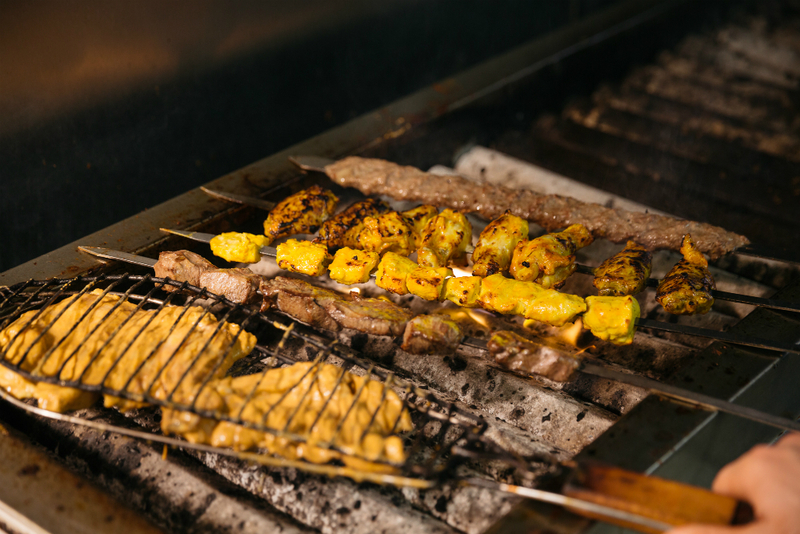 At Passion 4 Food, short cuts are side-stepped in favour of passion for the craft of kebab. The difference is in the taste.